One of the founders of the cypherpunk movement has just revealed new technology that he believes will revolutionize cryptocurrency from this moment on. 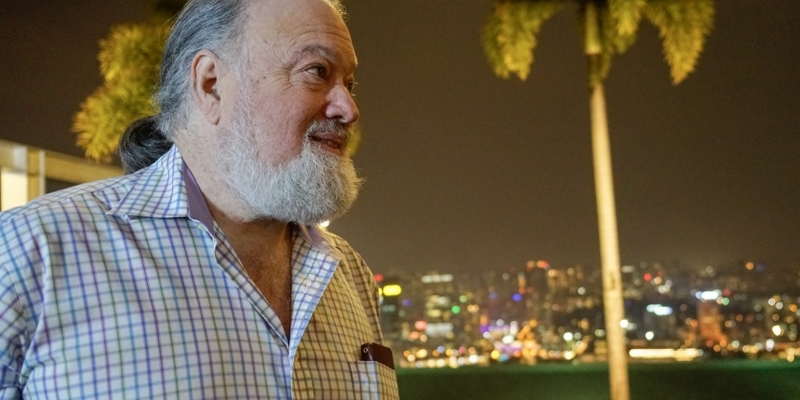 Revealed exclusively to CoinDesk, the grey-haired, digital money pioneer David Chaum is launching a new cryptocurrency Elixxir via his startup. And his goals are bold. By using cryptographic techniques he invented decades ago, he believes he’s “reinvented” cryptocurrency, fixing fundamental problems plaguing the emerging technology, including speed, privacy, scalability and – one that perhaps doesn’t get quite as much attention – resistance to future disasters. One of the most influential digital money pioneers leading up to bitcoin, the famed cryptographer has been sleuthing around cryptocurrency conferences recently – dropping hints here and there – sparking theories about what exactly he’s been up to. What he found, though, were many problems with the tech. Not least of all that it takes upwards of an hour to send a secure payment, which is not at all competitive with PayPal, Visa or other major digital payment systems. “Yeah, it’s not really suitable for widespread use,” Chaum told CoinDesk. But using his more than 30 years of experience working with cryptography and payments, including developing anonymous digital money eCash before even the internet existed, he thinks he’s found a new way to solve these problems. The cryptographer claims to have made two blockchain breakthroughs. One is to change digital signatures, a crucial cryptographic component of cryptocurrency, used to verify whether someone owns the cryptocurrency they say they do. According to Chaum, the way digital signatures are computed in most cryptocurrencies today is just a hassle. These signatures are just too computationally expensive as is, Chaum contends. “There’s no way we can get speed and scalability if for every transaction a server has to do a public key operation like making a signature or checking a signature,” he said. So, Elixxir changes it up a bit. “We can cheat a little bit,” Chaum said. Arguing that the system could carry out these public key operations “in advance,” Chaum explained that by doing this, Elixxir is no less than a thousand times faster than any other blockchain. “It’s a breakthrough. No one else does anything like it,” he added. The public key cryptography used in Elixxir has another impact as well – it futureproofs the cryptocurrency for the era of quantum computers. Currently, most cryptocurrencies architecture leaves them vulnerable to quantum computers. And while this technology is likely still a long way from release, Chaum thinks this is such an important notion that he argues governments should be spending time on making sure digital money is quantum resistant. Within the Elixxir architecture, Chaum believes “true privacy” can be achieved through so-called “multi-party computations” – a term he coined decades ago and a feature that’s used for enhanced privacy in cryptocurrency projects like Zcash and Enigma. The gist of the system is that a bunch of developers or nodes are involved in a cryptocurrency computation, but only one person needs to be honest in order for the computation to work and for the data to stay private. Elixxir uses this idea in a novel way. The nodes on the network, called “Mixnodes,” produce a multi-party computation for every block of transactions. Chaum compares this process to a group of people sitting around a card table. Each cuts the deck and shuffles, passing it to the next person. Say three of them are card sharks who know how to shuffle in a way that helps them to determine the location of the cards in the deck. But if just one of these people is honest and shuffles sufficiently, the card sharks, in the end, are “completely in the dark,” Chaum said. And in this way, Elixxir privatizes transactions. What brought Chaum to build Elixxir was suspicion and apprehension about the state of the cryptocurrency industry today. “In this space, there are a lot of unfounded claims being made,” he told CoinDesk. “People bend the rules. They try to present things in a way that makes them look as good as possible,” Chaum continued, arguing many projects “gloss over” various technical issues that could break or undermine a project. Yet, there’s a similar skepticism on the part of crypto enthusiasts investigating Chaum’s promises. A notable example is when the pseudonymous cryptocurrency blogger WhalePanda dug up the Elixxir website prior to today’s announcement, expressing concerns about what he found. While Elixxir claims to boost privacy, WhalePanda argued that requiring participants to send their name and location in a “KYC form” runs counter to those goals. But with the technical brief now released, the broader community will be able to determine whether the breakthroughs are actually that, or whether there are bumps in the system. All in all, though, while the project is currently focused on payments, Chaum believes Elixxir could play an even bigger part in ensuring more people have control over their data online.